Lata65 is an organization based out of Lisbon, Spain, that runs workshops for the elderly community who are interested in making street art. Yes, you heard right...street art! Their oldest artist is 90-years-old and their youngest is 59. 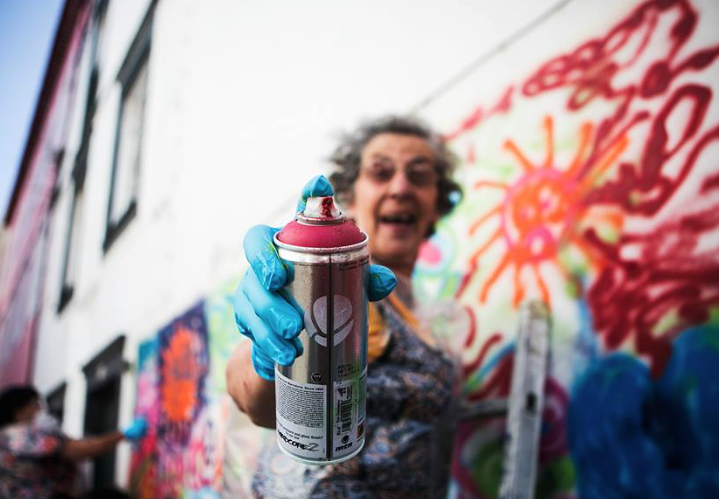 They are a group of eight women and three men, who have been crowned the "graffiti grannies." Lata65 was founded by 36-year-old architect, Lara Seixo Rodrigues. "Each year we ran the festival I noticed it was the older people, not the younger ones, who were really engaged," she says. And don't worry! These grannies aren't getting arrested any time soon. The walls they are provided to paint are supplied by Lisbon City Council's Galeria d Arte Urbana.